Art is certainly not just for the viewing but certainly for the wearing as well. Clothing is an expression and one's wardrobe is like a painters palette. It's always fun to put on something that makes you feel special, different, one of a kind. Leslie Palotas creates unique clothing perfect for your own creative clothing tendencies. Leslie combines carefully chosen colors and blends them with the advanced methods of dying and resist techniques of Shibori. The Japanese were responsible for the infinite ways to dye with Shibori through binding, stitching, twisting, folding, and other methods of reserving fabrics from the dyes. In order to create certain patterns, one must have the right fabrics and tools. Intricate designs like this wave strike one like magical artistry realized on the cloth. 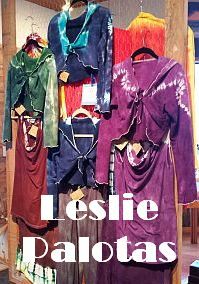 Leslie is picky as to what she dyes; the clothing needs to be comfortable, stylish, functional, and wholesomely sourced. One of Leslie's sources is Xylem Clothing from Eugene whom designs and creates their line of clothing from organic fabrics in incredible styles. The subject matter and the colors that appear on the clothing and even the clothing items come to the gallery in limited editions. Leslie will be working on waves or octopuses Yoga Pants, and then will be on to delicate patterns like light reflecting in water on infinity scarves. Leslie wears her clothing right into the sports that give her the ideas for her work. She enjoys surfing, kayaking, and other outdoor adventures when she's not creating in her Seal Rock home.